In view of the problems of post over Christmas and New Year it has been decided that the Bulletin will in future appear in January and July. In this issue we introduce a new and we hope useful feature – a digest of Tanzanian news over the preceding six months edited by Graham Mytton. Correspondence and articles for this Bulletin should be sent to Terence Ranger, Department of History, University of Manchester, Manchester, M13 9PL. On February 5th 1976 President Nyerere reiterated that the time had come for the two parties, TANU and ASP, to merge. Discussions began immediately and according to reports on Radio Tanzania there was little opposition to the move, although it is clear that there were differences of opinion on the role of the single party in Government. In September, after a four day meeting of its executive in Zanzibar, the ASP called for the implementation of the merger. At the end of the same month TANU’s Central Committee met. There was a joint session of the National Executive Committee on October 2nd to discuss the formation of a new party out of the TANU-ASP merger. A month later the two NECs were reported to have agreed on a new party constitution. The new party will be known as Chama Cha Mapinduzi (The Party of the Revolution). Its constitution was formally approved on New Year’s Day 1977 and it will be officially inaugurated on February 5th, the tenth anniversary of the Arusha Declaration. The new party’s headquarters will be in Dodoma and its new flag will be green with a hammer and hoe emblem. Prominent in world news has been the Conference in Geneva on the future of Rhodesia, at which Tanzania has been an official observer. Dr. Kissinger’s first port of call during his September shuttle diplomacy was Dar es Salaam Referring to Dr. Kissinger’s statement that the United States Government wished to support efforts to secure a peaceful transition to majority rule, the Tanzanian Government asked why they would be reluctant to support those who fought for freedom if all else failed. Following reports that 100 students at Makerere had been killed, 2,000 Dar es Salaam students demonstrated against ‘the fascist regime of Uganda’. They marched through Dar es Salaam on 9th August. It was reported that some of the students demonstrating in Dar es Salaam were Ugandan. In June the Finance Minister Amir Jamal announced major tax adjustments aimed at expanding wealth producing industries. Speaking to Parliament on 17th June, Mr Jamal said that the aim was to ensure that sisal, coffee and cotton farmers were totally exempted from taxation, or subject only to small taxes, when prices fall or when production costs increase. The proposal was that the sisal crop should not be taxed at all if its price fell below sh.8.00 per kilo. Personal taxes were increased, as also were taxes on beer, spirits, cigarettes, soft drinks, and textiles. The Government also announced that more than 40% of its £304.2 M. development budget for 1976-77 would be channelled into immediately productive projects. The remainder would be divided equally between infrastructure and Social Service. The third five-year development plan, postponed last year, came to life this year and will run until 1981. In a further effort to save foreign exchange and to rationalise the use of motor vehicles the Government announced further limits on the types and make of car imported. Cars allowed in from December 1976 will be Volkswagen, Peugeot and Datsun, while only Isuzu, Land-Rover, Range Rover and Ford Transit light vehicles will be imported. U.S. bank Citibank is to provide more than £1m towards the cost of a paper mill which begins to operate next year. The Chinese-financed railway to Kapiri Mposhi, completed well ahead of schedule in 1975, was handed over officially in July last year. Travelling on one of the first scheduled express trains from Dar to Kapiri, Nicholas Ashford of the Times reported that the train was seven minutes early after the 1,162 mile journey. It left Dar es Salaam at 5.50 p.m. on Friday and arrived at 4.53 a.m. on Sunday. Third class fare – £5.50. On Lake Tanganyika there are plans to replace the now unserviceable SS Liemba. A booklet published by the Prime Minister’s office in July shows that the number of villages increased from 6,944 in 1975 to 7,656 this year. More than 13,000,000 people live in villages. In November TANU in Dar es Salaam launched a new campaign, aimed at removing unemployed people from Dar and resettling them in rural areas. RTD (Radio Tanzania, Dar es Salaam) reported on 18th November that ‘hundreds of families’ began a new life under the ‘everybody should work’ campaign. Numbers were increased when the Dar es Salaam branch of TANU banned street trading. Despite claims on RTD that many people were coming forward voluntarily, soldiers, some of them armed, took part in a round-up of unemployed people. And the Daily News reported that of 250 settled in one village on Tuesday, 200 were back in the capital by Thursday. The prime minister, Rashidi Kawawa warned people not to ‘escape’ from the villages. Unforeseen problems arose. First, the tobacco factory which relies on the street vendors pointed out that it stood to lose about sh.4m. and would have to cut its work force. Second, it was soon clear that soldiers who were waking people up in the night, moving some of them without giving them a chance to collect personal belongings, were also moving people who were gainfully employed. The Daily News was forthright in showing up the shortcomings of the campaign. Dr. Leader Stirling, Minister of Health, told Parliament in June that the Government intended to nationalise all privately owned dispensaries and hospitals. Regulations were promulgated in December as an amendment to the present law. Medical Services will no longer be allowed to operate as commercial enterprises. Dispensaries and private hospitals will be abolished and patients’ fees and doctor’s salaries would be fixed. The construction of an agricultural secondary school in Kilosa has been completed. 280 students began studies there in December. The school is one of three being built with assistance from the Cuban Government. The two others are being built at Ruvu and Ifakara. Four teachers and forty-five pupils at a secondary school at Mwanza were expelled in August-September after trouble at the school. No reasons were given for the unrest in the official Government statement, but it is believed to have occurred earlier in the year. On Saba Saba Day, President Nyerere announced an amnesty to more than 8,000 prisoners. Those serving sentences of up to six months were released along with those who were serving sentences of longer periods but who had good conduct records. Two letters smuggled out of prison in October allege use of torture against political detainees. The letters make charges of poor conditions, of imprisonment without legal assistance, notification of families, or even any explanation of the reasons for the arrest. The detainees at Ukonga prison, says one of these letters, number 43. ‘These people have nothing in common other than their knowledge that it is possible to rot in a Tanzanian prison without being told why, without appearing before a magistrate, without having any legal way of expressing grievances, and in complete disregard of anything stipulated by the U.N. Human Rights charter’. The Attorney General condemned the letters as ‘a fairy story’, but also conceded that people were ‘not notified of the charges in 100% of the cases’. On 2nd October the Prime Minister inaugurated the Tanzania Newa Agency – Shirika la Habari la Tanzania. The agency will eliminate unnecessary competition between the different news media for stories. It has been planned for a long time but always been postponed for lack of funds. Following the recent cut-back in the number of civil servants, the Minister for Civil Service Development, Nicholas Kuhanga, told Parliament in July that many errors had been made. Those ‘retired’ early included some university graduates whose studies had been completed only a year earlier. Minister of Defence Edward Sokoine asked Parliament in July to approve a defence budget of Sh 962m for the year 1976-7. President Nyerere opened a new military academy at Monduli in September. Mr. Sokoine opened a Ministry of Defence seminar in November with strong warnings about the defence force’s high rate of accidents. He said that in the period 1975-6 there had been 820 accidents in the army resulting in 47 deaths. In the National Service the corresponding figures were 90 accidents and 8 deaths. The Chief of Staff, Brig. Mkwera, has been appointed to be the Director of the Rufiji Valley Development Authority. Brig. Kiwelu who was head of the Southern Brigade became the new Chief of Staff. TANU’s regional secretary for West Lake, Col. Marwa, has been given the rank of brigadier and put in charge of the Southern Brigade. To emphasise the party’s close connection with the defence forces the new military college is now called the Party’s College for Military Training. A big scheme for the construction of guest houses, roads and other facilities in the Kilimanjaro National Park was completed in December. Norway financed the project which included a road through the 295 square km park on the slopes of the mountain. Director of National Parks, Derek Bryceson, said the government was preparing to establish a new park in Geita District to the west of Mwanza. President Nyerere reiterated the Government’s commitment to the building of Dodoma as the nation’s capital. When he received the copy of the final masterplan from the Canadian Project Planning Associates in July, President Nyerere said that although it would take longer than the Uhuru railway the new capital had to be built. Another link in the evolutionary chain linking modern man with his ancestors has been found during excavations near Lake Ndutu. The skull was found at a site excavated by Mr. A. A. Mturi, Director of Antiquities and is thought to date between 500,000 and 600,000 years ago. (See Nature, August 5th 1976). Analysis of REVIEW OF THE NATIONAL ECONOMY, 1975-1976 (Hali ya Uchumi wa Taifa katika Mwaka 1975-76) published by the Government Printer, Dar es Salaam, 117 pages, price 25sh. The first thing which I noticed about the latest Review of the National Economy was that its price had increased by 25%, eloquent testimony to the still prevalent rate of inflation, which at 14.9% increase showed a decline from the 17.4% of the previous year. 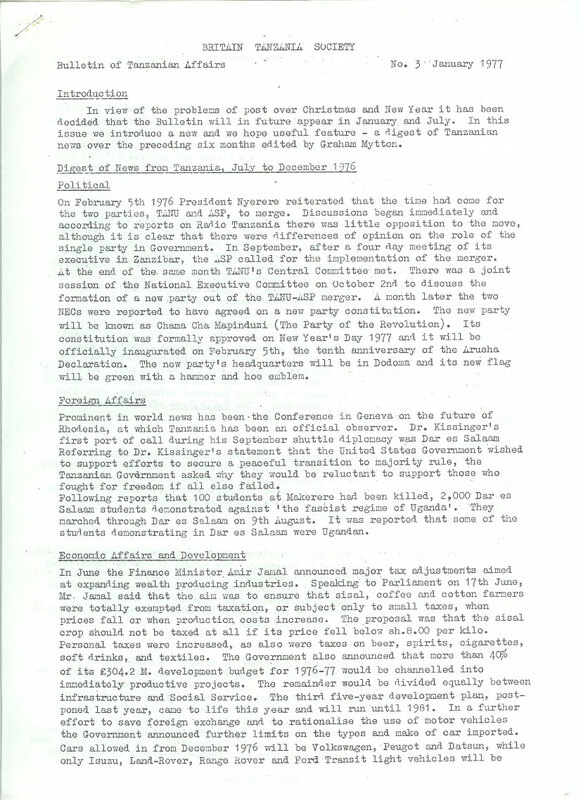 The opening sentence reminds us poignantly of stark African realities when it states that ‘the fear of famine lessened as a result of the fruits of the Do or Die Cultivation Campaign.’ Nonetheless, the National Income for 1975 increased by 4.6% – more them double the rate for 1974 largely owing to the greatly increased output of food crops. Output from other key sectors remained either at the 1974 level or slightly less. Industrial output, for example, again decreased, with only pyrethrum dust insecticide showing and improvement because of increased acreage under cultivation. 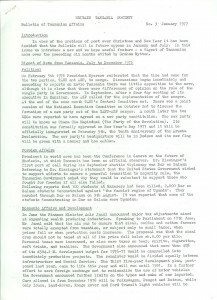 Reasons listed for the decline include shortage of raw materials, spares and essential equipment partly owing to higher prices, partly due to shortage of foreign exchange; lack of adequate capital investment; occasional shortages of water and electricity in Dar es Salaam, Tanga, Arusha and Mwanza, affecting breweries, cigarette and textile factories amongst others; scarcity of technical expertise in dealing with production schedules, and inability to follow up problems and put then right. Also, two somewhat bizarre reasons – ‘Lack of success in certain factories for various reasons,’ and ‘other technical and leadership problems in Fibre Board E.A factories in Arusha and in the Uvinza Salt Mines’: prob1eLls too peculiar to contemplate! The output of minerals continued to decline by 14.3% as against a drop of 4.79% in 1974 largely due to a decrease in the mining of diamonds and gem stones. However one rejoices to read that gold is confidently expected to be produced again this year on the Lupa. The building programme now concentrating on the new capital at Dodoma and improvements to Dar es Salaam harbour following the completion of the Uhuru railway, delayed by a serious cement shortage caused by the failure of the local cement industry, with an output of only 310,000 tons to match the current demand of 700,000 tons per annum. Present extensions to the Portland Cement factory at Wazo Hill near Dar es Salaam should help to improve the position. The balance of payments continues to pose problems. In 1975 exports decreased by 3.4% from £143 million in 1974 to £138 million in 1975, while imports increased by 8.3% from £269 million to £284 million mainly composed of machinery and equipment, a largo proportion of which comprised the rolling stock for the new railway. Thus the trade gap widened from a deficit of £126 million in 1974 to £146 million in 1975, while foreign currency reserves dwindled by over another £1 million, insignificant compared to the catastrophic drop of £30 million the previous year. Parastatals again increased their combined surpluses, this time by 20%. Unfortunately figures for the number of tourists visiting Tanzania in 1975 were not available for the first time for many years, although somewhat mysteriously tourist bed-units in hotels, which are given, increased by almost 20% from 493,000 to 592,000, so it looks as if all records were again broken in this vitally important invisible export industry. It would be interesting to know how many visitors came from Britain but the breakdown in the excellent statistical tables only extends to Europe. Britain again led the foreign trade tables with imports from Britain up by over 30% from £30 millions to £39 millions; although exports to Britain decreased by 16% from £21 million to £17 million she was still able to maintain her lead over any single country. Imports from China were down 7% following the completion of the railway. At home prices continued to go up but nothing like to the same extent as in 1974 – an overall rise of 7.2% compared to 40.5% But to the low income group of workers in Dar es Salaam this hit harder than to any other section of the community. An encouraging advance in the Social Services showed medical priorities being given to village health services and preventive medicine, whilst the new Bagamoyo hospital was opened in July 1976. 50% of 106 new dispensaries were finished during the year, the KEKO pharmaceutical plant completed and drug trials started. The educational effort is trying to meet the exciting target of getting every child of the right age a Primary school place by November 1977 and succeeded in increasing the number of pupils in Primary school by 232,411 children, a 50% increase, as a result of unspecified ‘urgent and revolutionary methods’ [see also later article]. The same methods doubtless contributed to the fact that by May 1976 some 12 million people, some 85% of the population, lived in 8,000 planned villages an increase of some 30% over the previous year. While the authors may make the modest disclaimer that ‘the progress of our economy during 1975 was on the whole disappointing’, this fascinating document vividly reveals how Tanzania has brilliantly succeeded in turning economic factors to her own social and political ends. Nowhere are the principles of self-reliance better demonstrated than by the educational campaigns which have been conducted in Tanzania under the leadership of the Institute of Adult Education in Dar es Salaam. The purpose of these campaigns has gone beyond a purely didactic purpose of spreading essential knowledge on important national or social problems. First, they have aimed at promoting rational and informed discussion and so bringing about changed attitudes towards matters lying at the centre of national social policy. Secondly, by synchronising the campaigns with practical changes promoted by government, the organisers have taken advantage of the opportunity to link education with action. Thirdly, the style of the written materials used and their relevance as demonstrated by the campaigns have notably reinforced the literacy campaigns carried out under government auspices throughout the country. One of the most surprising features of the Third World is the widespread dissemination of the transistor radio. In 1968 Dr Graham Mytton estimated that there was a radio audience in Tanzania of nearly 8 million people out of a total population of over 12 million. As an educational tool for reaching large numbers of people at very low cost per heed, therefore, radio seems to offer exceptional possibilities. The opportunity was all the more tempting because in 1969 less than 50% of children of eligible age were receiving formal primary education of any kind and Tanzania laboured under a heritage of illiteracy among the adult population which, though never accurately assessed, must have involved at least four out of every five. It was this unlettered multitude that were being invited to play an active part in the vast schemes of self-reliant economic and social improvement promoted by TANU and the government. Radio seemed to offer a most timely means of public instruction and to cut right through the formidable difficulties created by the immense cost of institutional education, the grave shortage of finance and the difficulties of physical communication in a country half the size of Europe. The experience of these programmes enabled the Institute to undertake in 1971 the first national campaign. In this year Tanzania was to celebrate ten years of independence and it was an occasion for taking stock of the hopes, achievements and shortcomings of this period. This campaign, under the general title, ‘Wakati wa Furaha’ – ‘Time for rejoicing’, dealt with the ancient and the colonial history of Tanzania, the rise of TANU, rural development, the cooperative movement, ujamaa villages, and the relations of Tanzania with Africa and the world. This campaign differed from its predecessors, not only in its national coverage, but also in the combination of radio programmes with organised study groups based on the use of a text and a study guide. In this way the advantages of a wide coverage could be combined with the better fixing of the educational image achieved by discussion of a book with chapters organised on identical lines to the radio broadcasts. It does not take much imagination to realise the severity of the practical problems posed by this programme. Nearly 20,000 people in over 1,600 study groups participated. The first problem was that of training the group leaders. This was accomplished by a programme organised in two stages. First, a series of six three-day training seminars were helped in different parts of the country by tutors from the Institute. Those attending with District Education Officers (Adult Education), Cooperative Education Secretaries [The Cooperative Education Centre at Moshi had considerable experience of study group work and 1,200 study groups of this kind already existed under its auspices in 1971. The Centre had a system of ‘wings’ in eight different parts of the country and five instructors were attached to each wing] from the ‘wings’ and adult education tutors [As primary school teachers in increasing numbers were helping with the adult education programme, particularly in literacy teaching, adult education had been included in the training given at the College of National Education] from Colleges of National Education. Secondly, numerous local seminars were intended to last for two days, but in some cases owing to financial constraints only one day could be devoted to them. Notwithstanding many difficulties arising from communication and travel problems and delays in the delivery of the printed materials, some 1,854 leaders were trained by this indirect system. Almost more difficult than the training of leaders was the production of texts and their distribution. Cost was the first problem. Some of the money came out of Institute funds but this was only sufficient to pay for one copy for each of about 900 groups. Fortunately, the Swedish International Development Authority and UNESCO came to the rescue with modest grants, which enabled the Institute to print 10,000 copies of the 116 page illustrated text-book – ‘Tanzania kabla na baada ya Uhuru’ and 3,000 copies of the A4 page study guide for group leaders ‘Kielekezo cha Mafunzo.’ Distribution of this quantity of materials all over the country in small parcels presented great difficulties. After Wakati wa Furaha came in 1973 a still larger campaign in health education under the title ‘Mtu ni Afya’ – ‘Man is Health’. This campaign coincided with important changes that were being made in the health services, leading to an increased emphasis on social and preventive medicine and a concentration of resources on basic health services in the villages. The principle of policy being implemented was to bring at least a rudimentary health service to people in all parts of the country before further resources were devoted to costly and sophisticated medical provision in the towns. Mtu ni Afya was an expression of this policy. By bringing about greater understanding of the causes of ill health and the measures necessary for its control and cure, it was hoped that the burden on the new basic health services would be lightened and that there would be a substantial dividend in personal well being, happiness and working efficiency. The campaign emphasised prevention and dealt with the five commonest causes of ill health, namely, malaria, bilharzia, hookworm, tuberculosis, and dysentery. The timely character of Mtu ni Afya was increased by the growth of new villages throughout Tanzania. Already in 1973, 750,000 adults were living in ujamaa villages, where new public health problems, were arising from the close juxtaposition of family dwellings. At the same time, an integral element in the village programme since 1969 had been the installation of dispensaries in villages alongside other social services. The new facilities for curative treatment due attention to health problems and encouraged an atmosphere in which the villager’s own responsibility could profitably be discussed. In this campaign, the enrolment target was one million adults meeting in 75,000 groups. This formidable commitment imposed complex arrangements for the training of group leaders in four stages. A two day briefing seminar at the Institute was attended by about 30 participants drawn from the Institute itself, the Cooperative Education Centre in Moshi, TANU, UWT (the women’s organisation), the Prime Minister’s Office, the National Service, the prison service and the police force. These participants then trained over 3,000 persons in 65 three-day district seminars, who in turn trained 75,000 group lenders in 2,000 two-day divisional seminars. To make sure that the message reached the final recipients in this protracted process, the Research and Planning Department of the Institute monitored the seminars at every stage on a sampling basis in the Coast and Morogoro Regions and on Mafia island. The general conclusion was that the content and quality of the message remained virtually intact to the final stage, though it was observed that the two day period was probably insufficient for the untrained and inexperienced participants of the divisional seminars. The documentation prepared for this campaign was much more varied and extensive than on previous occasions. One million copies each of two 48 page books were prepared in large lettering and in simple Kiswahili for the newly literate and incorporated numerous illustrations. In addition, 75,000 16 page group leader’s manuals were prepared. For the seminars a 16 page booklet was prepared, giving information about group study as applied to the subject of the campaign. Various cassette tapes of sample study groups were recorded and the group leader’s manual was used as a text at all seminars. These materials helped to ensure conformity with the objects of training at all stages. This impressive campaign was a great success, attributable not only to the organising skill of the Institute’s officers, but also to the active cooperation of the national bodies concerned. These were the Ministry of Health (Health Education Unit), the Ministry of National Education (Directorate of Adult Education), TANU (political education division) and the Prime Minister’s office (Rural Development Division). As with the Wakati wa Furaka campaign, an evaluation programme was instituted, this time on a much more extensive scale. A good deal more attention was given to the manner in which the Groups operated, the nature and causes of difficulties encountered, the extent of individual active participation and the practical effectiveness of the discussion method. Once again knowledge-gained tests were applied and a 20% gain in ‘health awareness’ was recorded, establishing beyond all reasonable doubt that learning had occurred. An interesting result that emerged was that the gain in ujumaa villages was 25% in comparison with l7% in other groups, but the variations within this result and the small size of the sample removed any certainty that the higher political motivation of the ujamaa communities led to more effective learning. But the effectiveness of Mtu ni Afya was to be found in the practical results rather than in the theoretical learning. From the start much emphasis was placed on the intimate connection between learning and doing, an association much emphasised in other fields of education under the banner of ‘elimu ni kazi’ (education is work) – Groups were urged to leave behind some kind of ‘health monument’ and it was hoped that groups themselves would undertake one or more corporate projects. Information about the widespread response to this initiative came both from supervisor’s reports of 2,131 groups and from case studies carried out in four villages in each of the two Regions. Reports showed that over 1,200 actions – cutting away of vegetation near houses, destroying pools of stagnant water, etc – were carried out in the villages reported on for the purpose of malarial control. Some 20% of the groups visited reported the digging, repairing or rebuilding of pit latrines and in Dodoma district, as a result of a decision by TANU (the ‘Bihawana Resolution’) virtually every family dug a latrine, where it had previously in many places been a rarity. The evaluation report estimated that in Tanzania as a whole hundreds of thousands of latrines ‘were dug as a result of the Mtu ni Afya campaign. An awareness of the connection between pure water and good health was another positive outcome as demonstrated by the digging of wells, and the boiling and filtering of water. Some groups decided to abandon the timeless custom of drinking from a common pot in drinking parties, discouraged spitting and the passing of a cigarette from mouth to mouth as a result of their new understanding of the transmission of tuberculosis. Mtu ni Afya was generously supported by SIDA to the tune of shs. 1,482,000 of which shs. 745,000 went on printing. This time SIDA helped to the tune of 2.3 million. The campaign was supported by the Office of the Prime Minister, the Ministry of National Education, the Ministry of Agriculture, the Faculty of Medicine at the University of Dar es Salaam, the Ministry of Labour and Social Welfare, TANU and Kivukoni College and was organised by the Institute of Adult Education. As before, extensive work was done on the appraisal of results and the establishment of relevant data. Much emphasis was placed on the practical outcome of the campaign in terms of increased efforts in food production and particularly in producing those foods needed to compensate for prevailing dietary deficiencies. The Research and Planning Department of the Institute has helped study groups to transform themselves into working groups devoted to food production based on sound dietary principles and plans to use the working periods for the purpose of ongoing instruction, thus providing an interesting realisation of the principle of ‘elimu ni kazi’. The first experiment of this kind was established early in 1976 at Chiwanda village on Mbamba Bay. A second similar experiment is to be started at Msindo Ujamaa village north of Songea with financial support from the British-Tanzania Society and with generous help from the Noel-Buxton Trust. The Msindo project will concentrate on the growing of fruit and vegetables and the rearing of poultry for the pot and for egg production. In November 1974 the National Executive Committee of TANU, meeting at Musoma, resolved after long preparation that by November 1977 every child of eligible age in Tanzania should be given a chance to enter a primary school. Considering that the enrolment ratio in 1969 was less than 50%, this decision imposed on the country and particularly on the education authorities an immense task of organisation and a formidable financial commitment. One of the most crucial problems was the provision of enough teachers sufficiently well prepared sufficiently quickly. To meet this challenge, the Ministry of National Education devised a new procedure for the training of teachers. Primary school leavers with two or three years of successful work in the villages will be carefully selected for training. They will go at once into the schools, and there they will teach under the supervision of a team of trained and experienced itinerant teacher trainers, who will give them first-hand instruction in the art of teaching, the use of correspondence education and other matters. In addition, the trainees will periodically attend seminars at education centres in their own localities and will supplement their basic knowledge and understanding with the help of radio and correspondence courses. The Institute of Adult Education is participating in the training programmes at two levels, by taking part in training seminars for the coordinators, of which there are expected to be about 3,400 for the whole country, and by organising and executing a radio and correspondence education programme for the trainees. Some eleven colleges of national education (the grade A colleges) will be actively involved by providing bases for the operations of supervisors and centres for short term training seminars. These colleges are already deeply involved in rewriting the primary school curriculum and in retraining serving teachers under the auspices of a programme known as MTUU (Mpango wa Tanzania/UNICEF/UNESCO). Although this campaign differs in many respects from previous campaigns, it wholly preoccupied the relevant departments of the Institute of Adult Education and is the object of a far-reaching scheme of evaluation by the Department of Planning and Research. As before, the instruction makes use of a variety of instructional channels, including for the first time correspondence education. The channels used in this campaign are correspondence courses, radio education, face to face teaching in seminars, individual discussions with coordinators and practical class room experience. The main areas of instruction are national development, and the methods of teaching reading, writing and calculating. In the seminars, there is opportunity to sort out problems arising in the course of instruction by radio or correspondence and these sessions also serve to boost morale and provide an opportunity for the discussion of practical difficulties arising in the classroom. As this campaign is now in mid stream, it is not yet possible to comment on its effectiveness. Something like 40,000 teachers are to be trained by this method over a period of three years, at the conclusion of which it is expected that they will be recognised as having the status of trained teachers. It is a formidable assignment, but one ideally suited to the multi-channel approach. It is worth repeating in conclusion, however, that in this case, as in the two previous national campaigns, a cardinal aspect is the link between education and action. In the training of teachers there is of course the added stimulus of the prospect of a teaching career. But in all these cases the motivation of students has arisen largely from the instrumentality of the training given in providing no sense merely for education’s sake, but is expressly for the purpose of liberating the unfathomed resources of the people of Tanzania. Poor though Tanzania is seen to be in conventional terms, she possesses great potential and largely untapped wealth in her human resources. It is these hidden treasures that the radio study groups and campaigns are planned to uncover. Mtu ni Afya: an evaluation of the 1973 mass health education campaign in Tanzania (Planning and Research Department, Institute of Adult Education, Dar es Salaam) pp. 91-94. Then I was able to join the party from England who went to Masasi for the Centenary Celebrations. It was wonderful to see so many old friends again … You will be able to see some of this and part of the great open-air service at Masasi on Granada ITV in one of their series, ‘The Christians’ (which will be shown next year).